So now we know what Empire State Development Corporation (ESDC) Chairman Charles Gargano meant when he used the term “friendly condemnations” two months ago regarding the Atlantic Yards project. As explained in a public hearing notice released yesterday, the ESDC will acquire nearly all the property in the Atlantic Yards site via eminent domain, including the 90 percent owned by Forest City Ratner. That includes city streets but not a few properties needed by the Metropolitan Transportation Authority. ESDC spokeswoman Jessica Copen explained: "When a development site is assembled by eminent domain, it is typical for the condemning authority to run any properties already owned by the developer through a 'friendly' condemnation, so as to clear any title defects that may have accumulated over the years." Copen's statement does reflect typical practice. However, George Locker, a lawyer who represents 15 of the remaining 55 tenants in the project footprint, contends there's another reason: to evict his clients, who live in FCR-owned buildings but are protected by rent-stabilized leases. "This is about getting protected residential rental tenants out of buildings," he charged. "ESDC is condemning rent-stabilized leases, contrary to the MOU [Memorandum of Understanding], and in violation of the tenant's rights and benefits, and the landlord's obligations under rent-stabilization. All of this chicanery will be the subject of litigation." Typically, a landlord who wants to demolish a building containing rent-stabilized tenants to build another building must apply to a state housing agency for a demolition permit and satisfy several requirements--a process that would take much longer than the projected timetable for approval of the Atlantic Yards project. 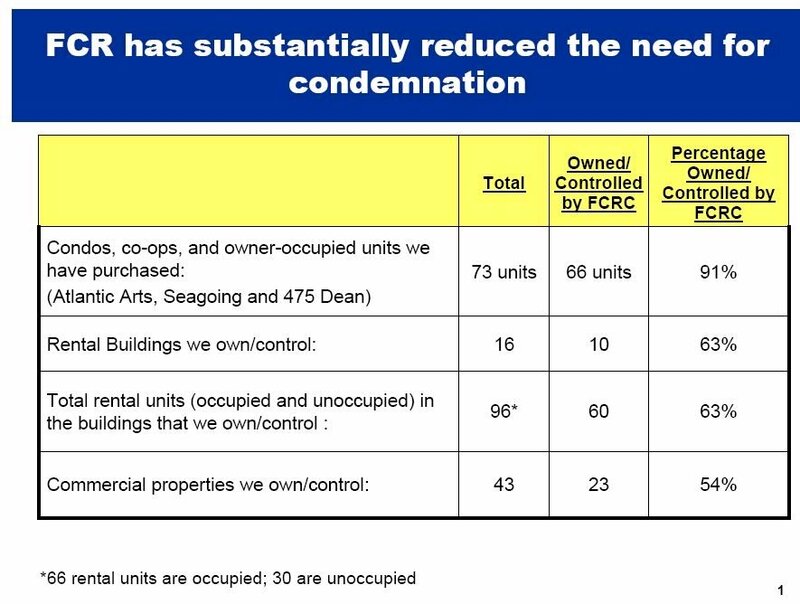 While Forest City Ratner says it owns or controls 90 percent of the project site, that percentage is a bit misleading; of ten buildings that still contain rental tenants, six are owned by the developer. 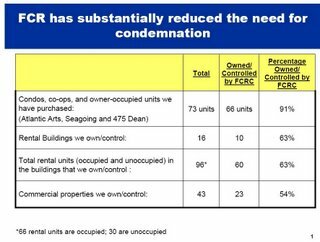 Even though those six buildings are counted in the 90 percent, FCR has not yet gotten tenants in those buildings to move. Of the commercial businesses, 13 have not signed relocation agreements with FCR, according to the ESDC. Five owner-occupied units remain; some of those owners have agreed to leave, while Daniel Goldstein, spokesman for Develop Don't Destroy Brooklyn has publicly vowed to fight eviction. 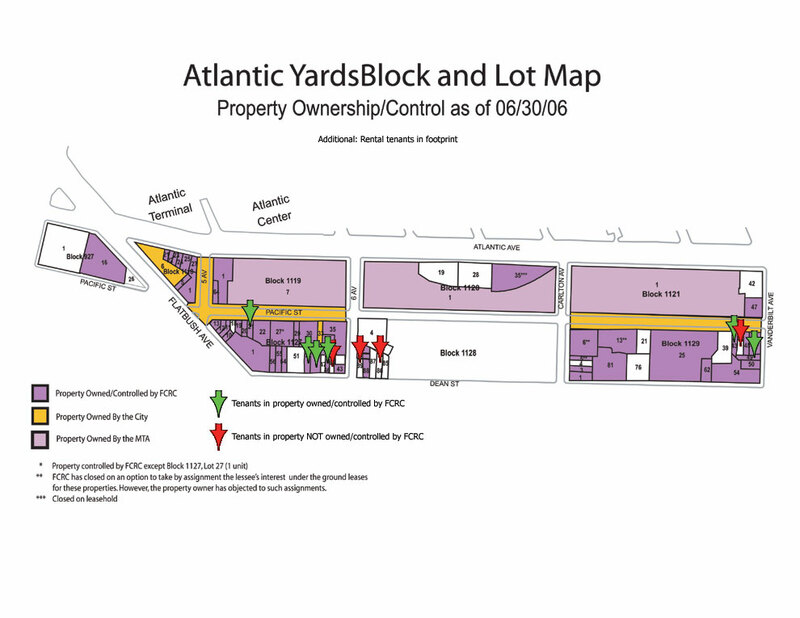 Above is an ownership map adapted from the ESDC map, while the list of occupied residential buildings is on p. 9 of Chapter 4 of the DEIS. With respect to Forest City controlled properties, it is expected that Forest City will either convey title to ESDC at no cost to the Corporation or that ESDC will, with the consent of Forest City, acquire title by condemnation, also at no cost to the Corporation. All of the properties within the Project Site would be acquired by ESDC... through uncontested condemnation in the case of properties owned by the City or FCRC, or through exercise of eminent domain in the case of properties and interests in properties that FCRC has been unable to acquire through negotiation. One source suggested that the use of eminent domain would secure additional tax exemptions. The ESDC's Copen said no, that the tax exemptions wouldn't derive from eminent domain. "In most ESDC real estate projects, the land is owned by ESDC and leased to a developer. When land is owned by ESDC, that land is exempt from real property taxes," she said. "The exemption derives from ESDC ownership--it doesn't depend upon whether the land was acquired by eminent domain. If the land owned by FCRC simply was conveyed to ESDC (instead of condemned), that land similarly would become exempt from property taxes." She continued, "Whether the developer pays mortgage recording taxes also has nothing to do with condemnation. 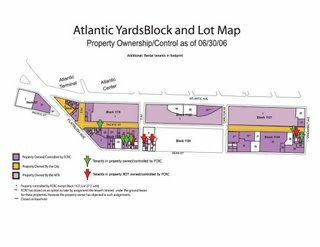 With ESDC projects, such as Atlantic Yards, whether the developer benefits from a mortgage recording tax exemption is an issue negotiated by the developer with ESDC and NYC." Locker called the move "a textbook explanation of the benefits of condemnation, not a response to clear public documents and public statements that say it will not be used on Forest City Ratner properties." He pointed to the 2/18/05 MOU signed by the city and state regarding the project, which stated that the ESDC would acquire "portions of the Private Properties... necessary to facilitate the Project." Locker says that suggests the ESDC would condemn only properties not owned by the developer. Now, however, it seems that the ESDC has deemed nearly all the "Private Properties" necessary to the project. [Addendum 3 pm 7/26] However, as another clause (right) of the MOU states, the developer was to convey the properties, not have them condemned. Locker also pointed to Forest City Ratner's PowerPoint presentation to the New York City Council on 5/26/05, which stated that the developer has "substantially reduced the need for condemnation." In retrospect, the term "unfriendly condemnation" would have been more precise. FCRC is changing its tune: Eminent Domain not be use "as a last resort," but because it is convenient.